It started with designy tumblelogs. Things to get stoked on or make me jealous or inspire some sort of attempt at interior decorating. Then some music logs drifted in one way or another. Now it’s old cars. Cars! I’m not even into cars. Little did I know I had such lust for a fast car from the 70s or a skeletal motorcycle. The car thing is great though. My dad knows his old cars inside and out. American made at least. Any time we see an old car while out and about he can name it – with year. Looking at these old car photos reminds me of that. Sometimes the whole Tumblelog and Ffffound curated internet can be a bit of a let down. It can take the adventure out of it. At the same time, it can also lead to new adventures. And I think that’s the point. Sure, you can be extra lazy and only rely on someone else’s finds or you can use those as a jumping off point into things you’d have never though to jump off into otherwise. Hooray for the hyperlink. Oh, and don’t forget Cushman scooters. Does this mean you won’t shake your head in boredom and disapproval when I want to go look at cars? Late model Audis and BMWs? Sorry, still a snoozer. Some stray beast from the ’60s? Sounds awesome. 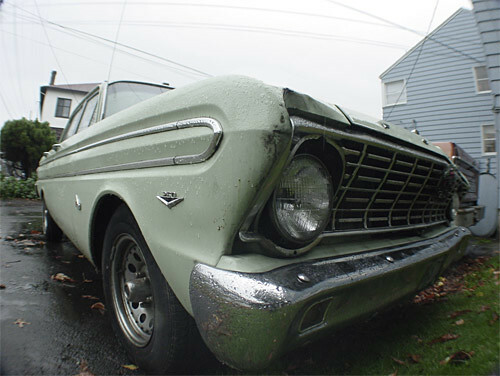 And yes, Ford Falcon, as per the photo, just black instead.